Our first project for young children will be the publication of a series of “Bird Song Ditties for Kiddies” written by Lang Elliott, each presented as an animated “Read Along” interactive. 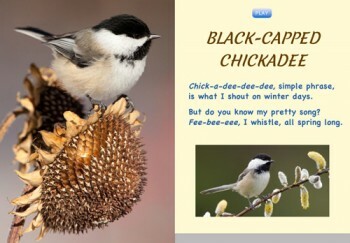 We’ve completed an initial prototype featuring the Black-capped Chickadee. Click here to see it in action! At this time, Lang has nine other ditties written and plans to add another ten or fifteen, once we establish some funding for this project. Below is the text for the ditties already written (Ditties © Lang Elliott; All Rights Reserved. Is what I shout on winter days. But do you know my pretty song? Fee-bee-eee, I whistle, all spring long. I play my flute from dawn til noon. Cheerily, cheeriup is my tune. See me there on your front lawn? I feast on worms, until they’re gone. my tail as short as my beak! and yank-yank is the way I speak. I wear a brightly colored gown. My song’s a whistled treat. Jay-jay, jay-jay, I do exclaim! rattles, squeaks, and toots galore! I laugh out loud: hee-hee-hee-hee! my call a bright soo-weet! fly up and around and back again. my laughable voice a part of the pack. my call a simple pink! and cry my name kill-deer, kill-deer.